-The HDMI Extender over ONE CAT5e/6 is a tool for extending your HDMI signal over long distances to a compatible display. -Instead of using expensive HDMI cables, your existing CAT 5e/6 cables/sockets can be utilized to perform advanced functions like transferring Deep Color (12 bits/color) video and digital audio, with a bandwidth up to 225MHz. -The HDMI Transmitter and Receiver, over ONE CAT 5e/6 extender is your substantial HDMI extender tool. -The HDMI Extender also support IR re-transmitting, so you can control the Source which is 150 meters outside using the HDMI Extender. 2.HDMI 1.3, HDCP 1.1 and DVI 1.1 compliant. 3.Support Deep Color up to 12 bits/color. 5.Uses one CAT5e/6 cable for data/DDC transmission. 6.Equalizes and recovers incoming TMDS data before retransmitting it in optimal quality regardless of the incoming signal quality. 7.Cable testing showed that with 1080p resolution the HDMI input source can be 10 meters away. 8.When transmitting a signal in 1080p resolution the CAT6 operating distance is 150 meters(max). 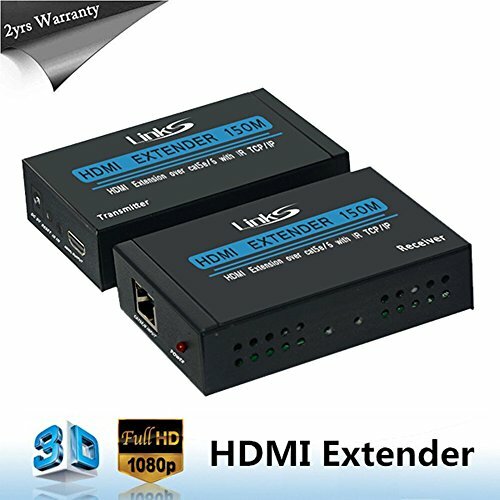 1.LinkS HDMI Extender is a tool for extending your HDMI signal over long distances(up to 492 ft) to a compatible display via a Cat 5e/6 ethernet cable. 3.Sturdy metal enclosure provides durability and minimizes EMI/RFI noise interference. 4.Plug & Play -- without any dip switch settings; Sturdy metal enclosure provides durability and minimizes EMI/RFI noise interference. Stand by Hot Swap.What's more, it is remote IR control. With two IR cables (Transmitter and Receiver), you can control a player or other HDMI video source from a remote location. 5.Plug & Play -- without any dip switch settings; Sturdy metal enclosure provides durability and minimizes EMI/RFI noise interference. Stand by Hot Swap.What's more, it is remote IR control. With two IR cables (Transmitter and Receiver), you can control a player or other HDMI video source from a remote location.